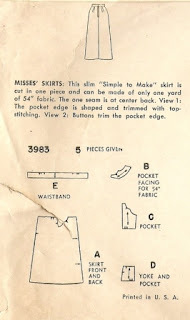 My vintage one piece skirt pattern turned up a few weeks ago. Amazing that I forgot to post about!! The envelope is in OK condition, a little brittle but that's to be expected with the age of the pattern (1950s I think?). I will probably do a colour scan of the envelope to use for everyday handling and pack the original away in something acid-proof. The pattern pieces seem to be in better shape, the paper isn't nearly as brittle so they should be fine to trace off. 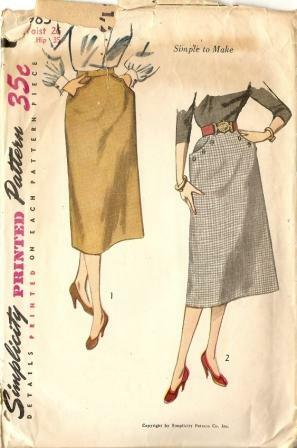 As you can see there is actually more than one pattern piece to this skirt, however the main skirt is only one pattern piece so I think thats where the nickname came from.